As many Evansville, Indiana area homeowners understand, mold is a very bad thing! Not only does it cause damage to your home, but it can also result in severe health problems for you, your loved ones and your pets if left untreated. It can affect your pets just as it can affect your family. If mold is present it will often cause your pets to get sick faster and more frequently. 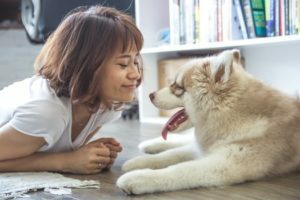 Since household pets are generally much smaller than humans, their likelihood of being exposed to mold-related illnesses is significantly increased. You should be familiar with your pet’s normal behavior, such as their eating habits or energy levels. If you notice any behaviors out of the ordinary, contact your local vet. Your vet can also provide with you with more information about mold and how it may affect your pet(s). If you believe your pet is suffering from exposure symptoms, contact your vet immediately. If you’re unable to get an appointment right away, remove your pet from the house to avoid continued exposure. If your pet reenters the home while the mold is still present, it can result in permanent damage to their respiratory system, or in some cases can result in death. Often, homeowners will wipe down the mold affected surface with bleach. While the surface of the material will be mold free, the surface is still not safe. Mold often grows deep into porous material and bleach can only hit the top of a surface, leaving a good majority of the mold left to grow back.